STEALTH HAS ITS PLACE, especially in the outdoors. Witness the growing popularity of the camouflage garment business and the extra money bow and rifle hunters are investing in scent blocker boots, pants and shirts that aid in stalking and still hunting, especially for whitetail deer and turkey. On the fishing front, fluorocarbon fishing line/leader sinks faster than regular monofilament and is reported to be less visible under water. Despite exorbitant prices skinny spools of fluoro leader command, its reported invisibility and toughness first became popular with commercial rod and reel tuna fishermen long before bass pros and fly fishermen knew it existed. Getting an extra edge is important to many. Fortunately for a retired chemist in Colorado, more and more serious fly fishermen are beginning to use clear floating and sinking fly lines, which are his specialty. In certain instances, clear fly lines spook fewer fish than the colored lines. This is especially true in shallow, transparent ocean and fresh water streams and lakes. Bob Goodale is a chemical engineer who worked for ARCO and Firestone in Ohio for years before he semi-retired and moved to Boulder, Colorado. The fact that Bob loves to fly fish obviously influenced his venue change. For a time in Colorado, he sold rubber seals for medical applications but he finally decided to follow his passion and produce a revolutionary fly line. John Simms and I were fishing on the Babine River in British Columbia and met Goodale in the late 1980s. During this trip he repeatedly talked about developing a stealthy clear fly line that would float. It wasn’t until 1993 that Bob’s first Monic Tropical Clear fly line arrived on selected fly shop shelves. As Bob promised, the line body was totally clear over a monofilament core. This innovation lent an extra element of stealth that surpassed just a longer leader for sight fishing especially in shallow water. But clear fly lines have a history of problems and it has taken time for the Monic concept to grow. Today more users demand its advancing versatility. Scott Kozlowski is the Monic line engineer who joined Bob Goodale in 1994 and has walked the unique product line into its latest fabrication known as Fish Specific Tapers. Scott and Bob have referenced the growing number of fishing guides and tournament anglers who continue providing helpful input and their personal clear fly line experiences. Scott promises new advertising and Web site updates on the latest Monic line configurations, tapers and capabilities. First a word about the original monofilament clear lines that arrived in the early 1970s when tarpon fishing with a fly rod was just becoming a Florida Keys growth industry. A prominent light tackle/fly rod angler named Al Pflueger Jr., who along with his father operated the world’s largest marine taxidermy company in South Florida, conceived the idea of a clear monofilament fly line. Pflueger had close associates within the Shakespeare Tackle Company in South Carolina and eventually obtained a prototype semi-clear fly line that sank very slowly. Al and a few friends had good luck while experimenting with the clear intermediate line. When Shakespeare finally offered the clear mono intermediate fly line, eager tarpon hunters snapped up 10, 11 and 12 weight versions and spooled their Fin-Nor, Medalist and Seamaster saltwater fly reels. Unfortunately, a manufacturing glitch crept into many of the heavyweight running line segments of the revolutionary product. The running line weakness went nearly undetected until anglers attached to 80 to 120 pounds of muscular silver. After tarpon broke a number of the new lines, the monofilament fly line concept suffered an agonizing setback that lasted nearly a dozen years. Finally in the mid-1980s Scientific Anglers introduced the Stillwater, a trout version of a clear intermediate sinking mono fly line designed for freshwater lake fishing. Intermediate lines that gently submerge just below the surface normally cast easily and allow true wet flies and streamers to perform exceptionally well. Also because they ride just beneath the surface film, intermediate lines are not blown around as much as floating lines during windy conditions. A clear line excels for blind casting. However, they are more difficult than a colored line to watch in the air. Thus a clear line challenges your accuracy when fishing to a shoreline with heavy and/or overhanging cover. Adjusting casting distances to moving fish targets is equally difficult. And regardless of their fishing efficiency and practicality, intermediate lines have never been great sellers until recently. Bob Goodale’s determination and extensive chemical background provided the world’s first and only clear floating fly line. Floating lines are popular because they are easier to pick up and cast when the need arises for a quick re-cast. The intermediate’s slow sink rate requires it to be stripped in much further before picking up for another cast. Although I don’t think Bob’s initial plan was to produce separate fly lines for fresh and saltwater fishing, that’s how things are today. Saltwater fishing is usually performed in warmer temperatures and water conditions (some Northeast saltwater is an exception). Therefore, formulation of material over the monofilament core had to be stiffer in order not to collapse or wilt in the heat. Clear floating fly lines are particularly coveted by Florida anglers pursuing giant tarpon, bonefish, redfish and snook usually in shallow water. As this shallow style fishing pressure continues to increase, experienced guides and fly fishermen realize that sometimes the slightest hint of a colored line causes especially cruising and feeding fish to change direction. Even after the cast the surface presence of a colored line is equally capable of spooking unseen cruisers whose sudden departure ultimately disturbs the entire area. Long ago in a drift boat I noticed that the average person both casts and fishes better when spooled with a brighter fly line. Many casts are made during a river day in mostly wide open conditions. Yet the easier it is for casters to see and follow their fly lines, the more accuracy they enjoy. Low light, windy and shady conditions add new problems best solved by easy-to-spot lines. Having explained my line observations above I was still surprised when I used the first 8 and 9 weight Monic floating lines after Bob introduced them in 1993. Adjusting casting distances with clear lines was tough. Even after a week of practice I was able to hang more flies in bushes and mangroves than seemed to land in the water! 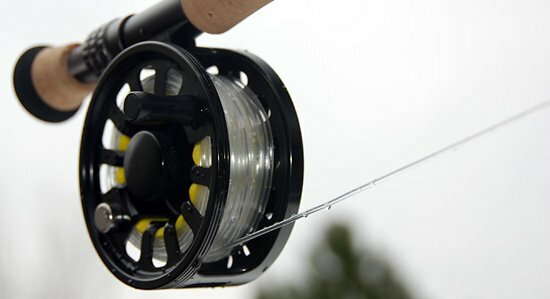 As previously mentioned, both clear floating and intermediate sinking fly lines have a variety of specialized uses. Freshwater lake fishing especially for trout, is by far the venue where most intermediate clear fly lines appear. Lake fishermen regularly use full length fly lines that keep their presentations at an even level in the water column and hopefully slipping along just above weeds. Monic’s clear floating tip fly lines helped me fool a number of Manuka beetle sipping brown trout cruising in New Zealand lakes. Tip sections of clear intermediate lines in lengths from a meter to 15 feet are also popular with anglers trying to duplicate sub-surface chironomid (midge) emergences to streamer and nymph presentations in rivers and lakes. 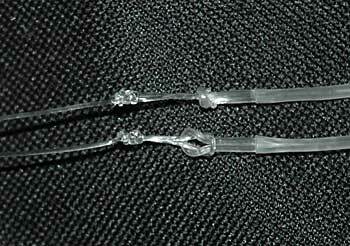 Steelhead and Atlantic salmon fishermen also employ clear intermediate tips as do some tarpon chasers. For the last three years, at the suggestion of several Florida guide mentors, I’ve re-spooled Monic clear tropical lines and reserve them for shallow water snook and redfish hunting. In spite of the clear line and long leader stealth job, a hard slap down or some other thoughtless casting behavior still spooks fish. But it is gratifying to watch a shallows-cruising snook pass beneath a clear line and not leave in a big swirl of scales. Oceanside and Gulf Coast tarpon chasers continue to report even more positive results when using the all clear floating lines for these heavily pressured fish. 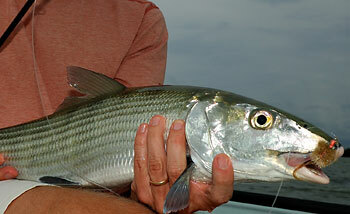 Monic recently retooled its tropical floating lineup with new tarpon, permit, bonefish and redfish tapers. The monofilament cores have increased to 32-pound test for everything except tarpon and permit models, which are up to 42-pound. The heavier monofilament also stiffens the line action and provides necessary strength when pulling on these tougher fish. 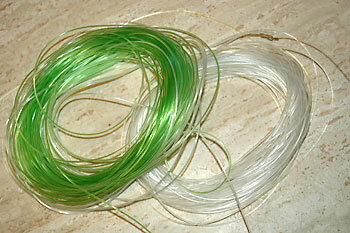 The line tapers were changed to deliver longer casts and softer landings for bonefish and tarpon presentations. Distinctive line belly tapers were redesigned to pitch bulkier redfish flies and the heavyweight crab patterns for permit. Monic is a small company with a variety of interesting products for fresh and saltwater fishing. Through his thoughtful introduction of Monic lines Bob Goodale has helped solve many problems. During a recent trip it was easy to recognize the refinements in tapers and firmer finishes in the latest Monic lines. More clear line casting practice is necessary now that they’ve been fitted to individual rods I cast best. I look forward to clocking some more Florida hours with these lines in June. It pays to be stealthy.